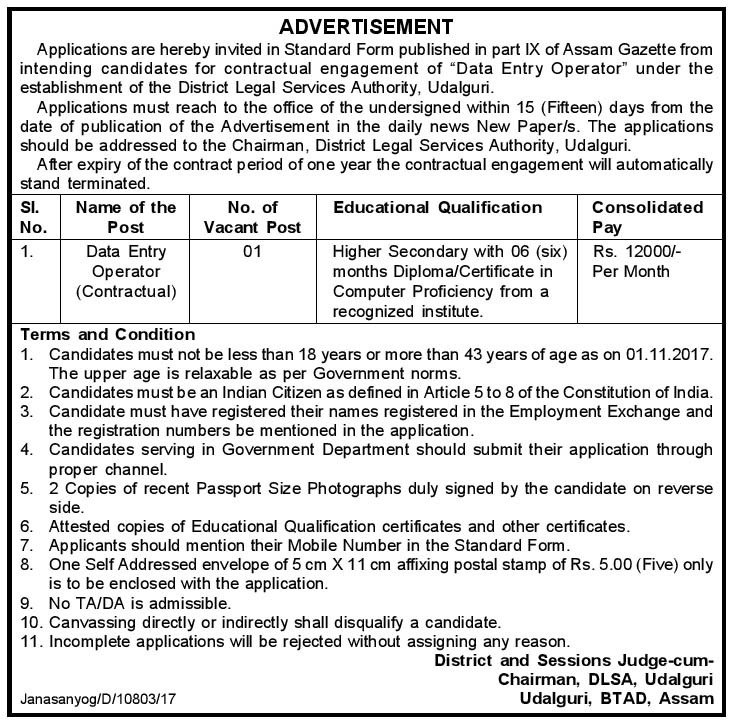 DLSA Udalguri Recruitment 2017 for Data Entry Operator (DEO) jobs under the establishment of the District Legal Services Authority Udalguri. DLSA Udalguri Recruitment 2017 notification about for filling up following Data Entry Operator (DEO) jobs under the establishment of the District Legal Services Authority Udalguri on a contractual basis. Qualification: Candidates should be Higher Secondary with 06 months Diploma/Certificate in Computer Proficiency from a recognized institute. Age: 18 to 43 years of age as on 01.11.2017. The upper age is relaxable as per Government norms. * Qualified Candidates will be called for written examination and for Viva-Voce/Interview/Computer Test. Interested and eligible candidates may apply in the prescribed standard form of application along with all required documentation should be reached the following given address within time. ''To, the Chairman, District Legal Services Authority, Udalguri. ''. Assam Skill Development Mission Recruitment 2017 Various Jobs. IOCL Recruitment 2017 Trade Apprentice. RMSA Assam Recruitment 2017 Vocational Teacher (IT) Jobs. * Last Date: Within 15 days (Advertisement in the daily news New Paper published in dtd. 16.11.2017 in Assam Tribune). Recruitment details of DLSA Udalguri Recruitment 2017. 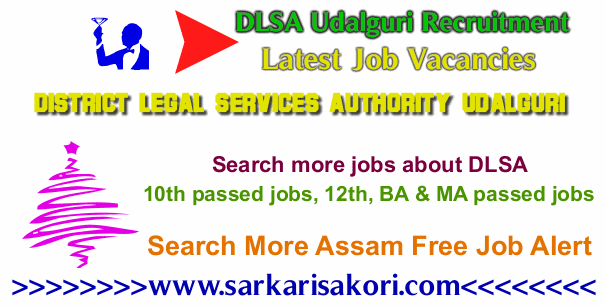 You will be interested more jobs about DLSA Udalguri Recruitment 2017 & Latest Assam Govt Jobs Alert 2017.